Ooo colored contacts. Exciting~ I know Fuji's eyecolor is different, but I suspect it's a hard color to capture. I like how they look on you! Do you wear contacts normally? I do wear contacts everyday ^____^ I have been wearing contacts for umm... Maybe 12 or 13 years? I don't have any problems putting them on, it's just sometimes my eyes are really dry, I have to use rewetting drops. I bought these contacts on eyecandy.com cuz of spontaneous interest hehehehe... they're okay, kinda dry and uncomfortable actually. 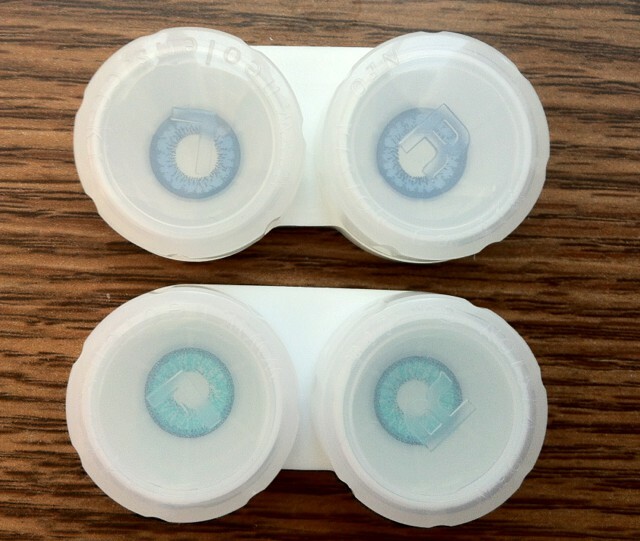 I know that Acuvue has "sapphire" color contacts. I wonder what they look like. I think if the sapphire contacts from Acuvue look nice, I might get those instead, because I know Acuvue is a good brand. Seconding perky, you do have real nice eyes. My eyes are naturally dark brown too so we would probably have the same look with those contacts. But alas, I'm afraid of putting things near/in my eyes, so contacts are a no go for me. No, I'm near-sighted. Can't make out any clear features unless you're within 1.5 feet (yes, I have an extra .5 ft on you!) XD So I have to wear glasses all of the time.